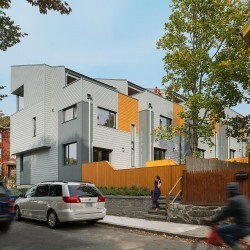 The E+ Green Building Program is an intiative the City of Boston / Boston Redevelopment Authority purposed to proving the feasibility of regenerative multi-unit residential buildings and to building energy and environmentally positive homes in Boston’s neighborhoods. 226 - 232 Highland Street is the first building completed in phase one of the Program. My family could afford to buy and own this house because of its passive design and E+ rating. Although we didn’t realize it when we bought it, owning an e-positive house not only reduces our cost of ownership by lowering our energy expenses, it generates sufficient revenue to more quickly pay down our mortgage. (Ted Resnikoff, Owner, 226 Highland St). Urbanica Development and ISA Architects, the developer / design team, were selected through a competitive design competition held by the Boston Redevelopment Authority. Our goal is to create low-cost, energy-positive, and environmentally sustainable multi-family housing that stands as a model of responsible, contextual residential development. Based in a holistic approach toward sustainability, using both low and high technologies in creative, efficient ways at all levels. However, it is the belief of the team that sustainability is not simply a technological fix, but a reconceptualizing of our outlook on the relationship between ourselves, the environment, and our lifestyle. The goal thus was to promote housing that actively engages residents with their local environment, neighborhood, city, and region. By re-evaluating and investing in our existing neighborhoods, they may become denser, more diverse, and more active while maintaining a smaller footprint on the earth. 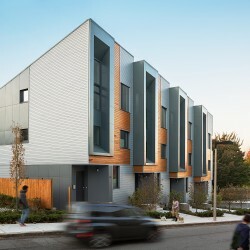 226 - 232 Highland Street is an adaptable townhome building that is a replicable prototype of efficient residential construction for Boston and similar cities through the Northeast. The building consists of four three-bedroom units, each approximately (1970 SF), in a row house configuration. The building’s form and orientation serve to maximize natural daylight and solar gain for the photo-voltaic arrays that annually generate more electricity than is needed on site. The approach includes two major strategies for energy reduction: first, a super insulated envelope minimizes heat transfer without relying on mechanical conditioning techniques; second, feedback mechanisms that provide information and prompt to users in the house regarding their energy-related activities. The project is thus efficient in energy, resources, use, and space throughout. embue Intelegent Buildings provides active monitoring of energy consumption and production for the each unit owner and public facing E+ Dashboard at: https://secure.embue.com/eplus-dashboard/. The four unit project annually surpluses over 8,000 kWh of electricty, returning to the grid enough energy to annually power a typical code compliant home. Unconditioned crawl space with vapor barrier with crush stoned at grade. 12” double 2×4 - 24" OC wood stud wall with Zip system sheathing and Siga taping and fiber cement siding on furring. Wall cavity filled with dense-packed cellulose and interior drywall finish. Schuco Brand, Low-E, triple paned uPVC doors. New construction, wood frame, four unit townhouse building, three stories tall. Redevelopment of a vacant urban residential site. Fronting on Marcella St., Highland St., and Fulda St., the site gradually slopes up from Marcella St. to Fulda St. The site was vacant at the time of redevelopment however records from 1899 show a multiple residential buildings tightly fitted on the site. Renewable Energy System Description & Details: 235 W Panasonic HIT PV panels (Model VBHN235SE01) with an module efficiency of 18.6% (Installed at 4:12 slope) Enphase Micro Inverters (95.5% Efficiency Rate) Model: M210-84-208-Sxx Rheem SolPak RS80-40BP, 40 square foot solar thermal panel (2.4 Solar Energy Factor) with an 80 gallon storage tank for hot water requirement. 14’’ TJI with Zip system sheathing and Siga taping + R-15 rigid above. Cavity filled with dense-packed cellulose and interior drywall finish. Schuco Brand, Low-E, triple paned uPVC windows. Domestic hot water - Manufacturer & Model Rheem SolPak RS80-40BP, 40 square foot solar thermal panel (2.4 Solar Energy Factor) with an 80 gallon storage tank for hot water requirement. Blower Door Test: Infiltration was test at be 0.57 ACH (air change per hour) at 50 Pascals pressure difference. Air flow is allowed to move from the lower floors of the home to the top floor. Upper level windows and a clerestory condition allow for venting excess heat and help to provide more consistent interior temperatures. 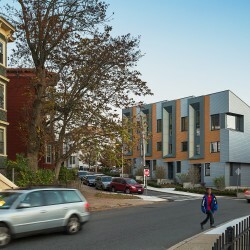 The project is the result of the Boston Redevelopment / City of Boston E+ Green Building Program. The design / development team was selected through a competitive design process that challenged leading practitioners to envision and building the next generation of residential urban structures. Integrated project planning was a competition requirement and included utilization and submission of a HERS model with the proposal. Upon designation the project team held a charrette with city staff leading the initiative. The developer worked with the New England Council of Carpenters to utilize the project as a learning and training site for apprentice carpenters. The buildings are designed to last over 100 years. The primary objects were to build LEED Platinum, net energy positive, urban residences that were market feasible and replicable. No. Of interest is that building performance has improved in the second year as owners fine tune their management and use of the building.